This was one of the iconic Roman battles and illustrated the superb generalship of Julius Caesar. Vercingetorix and a large force of Gauls (possibly about 80,000) had occupied the fortified oppidum of Alesia. Caesar with a much smaller force of approximately 60,000 troops laid siege to Alesia. However, having the smaller force wasn’t the only problem facing Caesar as there was a second Gallic army of more than 100,000 Gauls coming to relieve the siege. 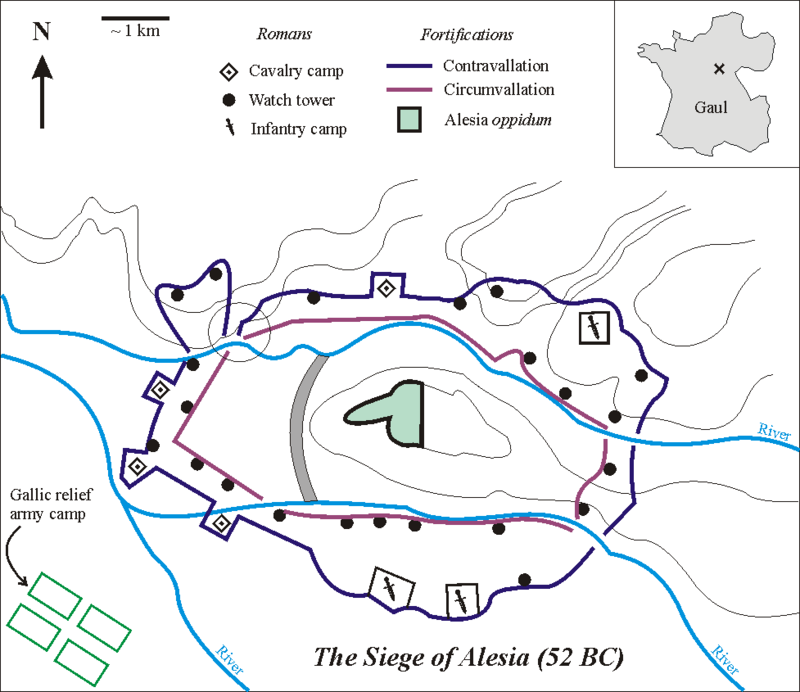 Caesar started by building walls around Alesia to trap Vercingetorix and his forces within. The circumvallation required 18 kilometres of 4 metre high walls. Then to protect himself from the relief army Caesar built another wall facing away from Alesia the contravallation was 21 kilometres long. It needs to be remembered that all of the building works were conducted under enemy threat. The trapped Gauls were hoping that if they released the women and children, not only would their food and water needs drop but Caesar would open the walls to allow the civilians to leave giving Vercingetorix and his troops a breach in the walls they could storm. Caesar did not comply and instead allowed the women and children to remain trapped in the no-man’s land. At end of September the Gauls, commanded by Commius, attempted to break in by attacking Caesar’s contravallation. Vercingetorix ordered a simultaneous attack from the inside but both forces were defeated. The next evening more Gallic attacks took place and met with some success. Caesar launched, a desperate surprise attack, against the relief force. The retreating Gauls were slaughtered after which Vercingetorix, seeing no other way out surrendered himself to Caesar. This siege marked the turning point in Caesar’s Gallic wars.